Today Defkalion Green Technologies published 2 new important documents. The first is a full preliminary technical data sheet for it's Hyperion (Kw Series) products. The second was a press release mapping out their plans for the introduction of their Hyperion product. Today, and through our company website, Praxen - Defkalion Green Technologies Global has disclosed its current work on Nickel and Hydrogen exothermic reaction using Chemically Assisted Low Energy Nuclear Reactions. Praxen - Defkalion Green Technologies is a strong supporter of LENR technologies globally. Greece can become the global centre for R&D on LENR technologies. We have already received numerous requests from leading scientific authorities, academic institutions and national laboratories from key countries to conduct tests on our products. Our policy is to accept their requests, under agreed protocol, and to allow publication of their findings. The process of agreeing to dates for such tests depends on the availability of our staff and labs, keeping in mind that we run a business, not a technology show room. "Defkalion's scientific R&D team have successfully managed to trigger and monitor Chemically Assisted Low Energy Nuclear Reactions caused by Nickel and Hydrogen nuclei. Following extensive experimentation on the preparation, cleaning and degassing of Nickel clusters and atomic Hydrogen systems, valuable knowledge has been gained. The data was obtained from conventional, non-specifically designed for LENR instrumentation, such as mass-spectrometer, gas-chromatographer, Wilson camera, SEM spectra and others". "Such measurements of phenomena gave us strong evidence on the activation mechanisma of Nickel that allow the nuclear capture of Hydrogen (the "breaking" of the Coulomb barrier), as well as the thermalization mechanism in a dynamic system of multi-stage set of reactions. 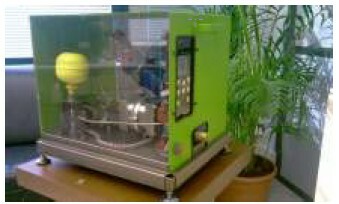 Due to the elapsed time between the phenomena and their measurements using the above mentioned instrumentation, an incomplete proof of theories still exists, However, the obtained data provide us with a solid basis to control the triggering and termination conditions of the Ni-H reactions within Hyperion reactors, as well as the necessary conditions for stable performance." 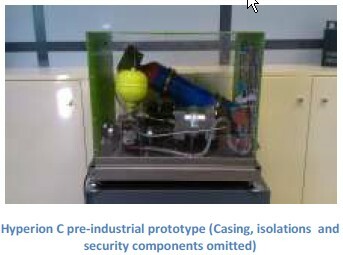 "As a result , the above mentioned efforts led to the design of safe and stable Hyperion pre-industrial product, following the specifications described in this docment." "Defkalion GT is an industrial company and not an academic or research institute with a role to state, prove and reject theories; as such, we recognize that products do not need to be based on theories. However, we do recognize the importance of scienfific knowledge for further scientific research and product development. For this reason, we have decided to invest on a new series of on-line real-time mass spectrometers, designed specifically for LENR and Hyperions, that we are developing and testing in Greece. It is our intention to publish all relative measurements in scientific journals and events, when our tests are finally concluded." Q: How quickly can the system come up to power? Also, how fast can it be turned down to idle mode? A: Please indicate an example of configuration (single or multi-reactor, kW and maximum allowed temperature). We will consult our R&D to check tables and we will provide you with a precise answer the soonest. In general, the mean time to put a Hyperion from 0 to 100% of its capacity is 6,5min. Q: Could you clarify how long the Hyperion can produce excess heat continuously ? Thanks. A: As you can see in specs, for at least 6 months non-stop (for any reason). Will it be controllable by some form of thermostat so that it can be used to heat an environment?I read the specifications but do not recall seeing answers to these questions. I note that Rossi has aparently demonstrated his ecats in Self sustain mode for brief periods of time, after the kernals have been preheated to operating temperature. In your nicely crafted report there are various modes of operation mentioned but a self sustain mode seems to be absent. Is self sustain possible under the currently developed control system? Or would you prefer to avoid the term self sustain for the time being due to its radical connotations..
A: Hyperion is a system, not just a bare reactor. And the system uses pumps and electronics that need electric power in normal operations. So, there is not really a sustain mode in such systems. PS Please notice also that we indicated COP for single or mult-reactor systems and not for bare reactors. A: Indications on prices for the Greek market you can find in several publishes in Greek newspapers in Press Section of our site. In case you can not read Greek, this indication is 5.500euro per multi-reactor system (installed) and some hundreds of euros per year for recharge/support/service. Official price lists for local and international markets will be announced later. Note: All multi-reactor systems will have the same selling price, regardless if they are of let us say 20 or 35 or 45 kW nominal power. In all cases, 9 reactors are in the kernel. Up to 4, 7 or 9 respectively in this examble, are allowed to operate concurrently by their setup. So the recharge period varies, as far as all 9 reactors may service the system following a balancing algorithm. So, recharging period is not always 6 months. It can be more as stated in specs. Q: This question, by a consumer point of view might probably be irrelevant since each six months (in single reactor units) the nickel charge and the hydrogen bottle get replaced completely, but I was wondering on a scientific point of view what is the consumption of Hydrogen and Nickel in grams for, let's say, a 10 kW unit continuously running at 100% power for six months? (or better and more generically, using a more proper unit of measure, in g/MWh) Could you also state how much Hydrogen and Nickel would such unit start up with? Perhaps for Nickel a more correct word than consumption would be transmutation (assuming this is what happens in the reactor core, as with Rossi's). If you agree with this, could you tell how much of it, in the example above, gets transmuted after six months of use? A: The most serious reason for a 6-12 months recharge of Hydrogen and Ni is not their consumption (or if you like the transmutation of Ni) but pure engineering reasons. Hyperions are quite new, so we will need to run diagnostics test for the kernel's peripherals in situ at least every six months in the first period, according to our present analysis of different components or subsystems and the service protocols. Later on, these protocols may change as we expect. "Praxen Defkalion Green Technologies (Global) Ltd., is based in Cyprus. It owns full rights to its own technologies and will sell exclusive rights globally for the production of its proprietary products (Hyperion)." A new discussion has appeared on the Defkalion Forum, but is currently "locked" in preparation for the release of today's announcement. Defkalion Spokesman: "“I Know What He’s Got in the Reactor, I Know Everything." According to this new NY Teknik article the University Of Siena ran a spectroscopy of Rossi's eCat at some point and consequently it revealed to them the contents of the reactor, presumably revealing the secret catalyst which enables the Nickel Hydrogen to fuse. "The University of Siena. They tried his reactor without him understanding what they did. They checked it and we know what’s in the reactor. So it’s a matter of two or three months that my scientists can reproduce that, but I’m not going to try it. I’m playing a fair game. Defkalion Green Technologies (DGT) will make a big announcement tomorrow (Wednesday) following many weeks of build up and anticipation. Third party testing and certification of Hyperions underway, perhaps even positive results from a credible third party. More documentation including Final product specifications and probably some photos. Initially, Defkalion had been working closely with Andrea Rossi on an ambitious commercial project to roll-out eCat fusors to the masses. The plans included a factory working at full capacity producing 300,000 Hyperions (DGT Name For Their eCat Fusor), with plans for additional factories and research facilities in Greece. That is until the relationship soured with Rossi citing financial issues as the cause of the breakdown in relations. Defkalion countered with accusations that Rossi did not "meet parameters such as the stable operation of the device for at least 48 hours". Defkalion seem very confident launching their Hyperion technology, while Rossi has been adamant that Defkalion do not know the industrial secret in order to successfully manufacture and produce the reactor cores. The industrial secret being the method of preparation and treatment of the powdered Nickel with an as yet undisclosed "secret" catalyst. When you look at everything that has happened since January, Defkalion have sensibly bowed out of getting involved in name calling and the media circus that surrounds Rossi and have maintained quite a professional stance since they first came on the scene. One of their first statements was very positive indeed and also seemed to imply that Rossi's was not the only technology they were working with when they said Defkalion has: "Enhanced technology and engineering on Rossi’s invention or similar inventions". More recently they produced this press release which features pictures of Hyperion prototypes and of the inside of their workshop. "We have to clarify that two of the pictures in our November 14th Press Release are from a low-end Hyperion single reactor pre-industrial version7 prototype. Several components on it (isolations, security components, anti-explosive protection, casing, functional I/O etc) have been deliberately omitted." "Final products for mass production, that will be released following their prototypes certification, do have some minor differences in engineering/architecture and their assembly quality. A full specs sheet as well as product's basic design and their scheduled third party testing will be released as per our announcement of November 14th. More recently an article with Defkalion's Alexander Xanthoulis in Greek publication Tovima shed more light on developments with Defkalion painting themselves as having a more stable and advanced product than Rossi. The article has been through Google translate, so as always some of the meaning is lost in translation. So the rift between you was not due only to non-payment of first installment repayment, said Mr. Rossi? One rather positive outcome in all this is for neutrals is that despite the cavernous differences of opinion between all of the parties, Defkalion, Rossi and even Piantelli and Krivit - they all agree that the LENR phenomena is real. This fact alone should give sleepless nights to even the most determined pseudosceptics. It is possible that this announcement by Defkalion will be relatively tame, but I don't expect that to be the case. There is a small, but nevertheless potential possibility that If Defkalion have progressed far enough to announce positive independent test results from a well-respected third party then this whole thing could go supernova overnight. Whether tomorrow is that day or many weeks away I have a strong feeling we ain't seen nothin yet. A smattering of mainstream media exposure so far is nothing compared to the what is coming down the line. In a very promising announcement on Rossi's blog today we have something very positive to look forward to - the public disclosure of a North Eastern USA based company who have purchased one of Rossi's 1MW ecat plants. How long do you think it will be before there is a 1MW customer that is willing to talk about their experiences with the product and act as a reference? Having another customer out there who is willing to act as a reference could provide tremendous leverage. This would be far more valuable than any public test. It would silence the skeptics forever. Previously we had heard that Rossi's trip to Massachusetts had not been fruitful, but it looks like this new customer was picked up there. So which large companies in NE USA would be interested in buying a 1MW fusion reactor? You decide.